I’ve been going through these points with a few friends recently, and it struck me that it would be useful to write them down. Here’s the situation: you know you’re going to be going self-employed / become a freelancer, but that time hasn’t come yet for whatever reason. Maybe you’re working out your notice, maybe you’re waiting to hear when you’re going to be made redundant, maybe you’re in negotiations, maybe you’re moving to a new city and will be setting up there. Whatever the precise situation, you have some time now to prepare for the future. Use it wisely and you can hit the ground running (sorry for the cliché) and be in the best possible position to start picking up work and collecting clients. Whatever country you’re in, you should be able to look into going self-employed, make sure you have all the paperwork and details you need, perhaps take a course (in the UK, the HMRC courses are now run online) and even register as self-employed (you need to do this within x time of your first income from self-employment, so why not sort it out now?). ALso remember that if you want to submit your tax return online, there’s a separate process to do that and you need to do it as early as you can (more info here). These don’t need to be complicated. They can just include your name, email address and phone number and maybe a website url (see Point 3). Get them from a relatively inexpensive site like VistaPrint (I get mine done there, you can tweak them to not include the VistaPrint logo and get relatively good quality). In time, you can get fancy cards with logos. You don’t want to be in the situation where you attend training on setting up your business, meet a potential contact and don’t have a card, or be passing out your wife’s card with your name scribbled on the back. Be ready to meet opportunities. Get the basics up now so you have somewhere to point people. It doesn’t have to be fancy: just one page with your contact details, an idea of what you do and a photo will do for now. You can expand on it later on. This is also a place where you can collect testimonials and start building your reputation. If you use a platform such as WordPress, you can buy your domain name from them, so you don’t have “WordPress” in the URL. But I don’t think that matters as much as it used to, so if you’re not sure that you’re going to be self-employed long term, by all means just register the liz.wordpress.com type URL. If you haven’t thought up your business name and haven’t got time to sort out a URL and any hosting issues, there’s no harm in writing up the text for your first pages so you have it to hand when you’re ready to set up the website. Do not, at this stage, get tempted into paying thousands of pounds for an all-singing, all-dancing website. You don’t that at this stage, and you will end up radically changing your website in the first year of trading anyway. Save up for that until you know exactly what you want. This point is about web presence and having somewhere to point to right now. I recommend reading a couple of small business books and also picking out some blogs to follow. Choose a couple in your line of business and a couple of general business blogs. You might even start interacting on the comments and asking advice, even making some small business friends. This is the one that most small business people find trips them up in the first years of trading. Certainly, my terms and conditions have been forged through mistakes, panics and worries. I really wish that I’d had statements on what I will and won’t cover in terms of subjects, specific information for students, information on how I invoice and when I expect payment, etc., set out somewhere. I meet many people who learned this the hard way. To get these together, it’s worth looking at other people’s in your industry, or turning to services like those of the Federation of Small Businesses, who offer members template customer agreements and terms & conditions. a. Make sure that you have a separate bank account to run your business through. This can be an untouched current account, again, you don’t have to have a fancy and expensive business account to start off with, but make sure you can keep the business separate from your personal money. Your accountant will thank you for this, and it will make it easier come tax assessment time, too. b. Make sure that you have some living money for those early days. Tighten your belt now, if you can, and put aside as much money as you can. The general recommendation is three to six months’ worth of basic living money (rent/mortgage and bills) put aside to see you through. By going part-time, I got myself a year (of very basic living) ahead of myself. It just gives you that breathing space. While you’re working out what your basic living expenses are for Point 6, it’s worth setting some targets for your monthly earnings. Make them cumulative, so that if you have a bad month, you can still see that you’re doing OK. For example, if you want to earn £24,000 per year after tax, you’re going to need to earn at least £32,000 before tax. That’s £2,666 a month. If you earn £4,000 in January but only £1,350 in February, it’s useful to know that you’ve made just over £2,666 a month on average. I like to set three targets a year: one to cover basic living expenses, one comfortable one and one to aim for, as this gives you room to expand faster but not on just impossible target. You’re going to end up using Twitter, Facebook and LinkedIn as a business person, you can’t help it. So get to grips with them now before you’re faced with a Twitterstorm after an unconsidered Tweet! While you still have access to colleagues and even perhaps clients who might be able to give you a testimonial, ask them for it. If you have a LinkedIn account set up, you can use that to request references. If you’re doing bits of the same work you’ll be freelancing in for free, ask for testimonials. Always ask if you can use the testimonial on your website, and check if it’s OK to put the person’s name and company next to the testimonial (the more traceable the reference, the more powerful it is). This way, you’ll start off with some visible backup and proof that you are who you say you are. Going into a different industry than the one you’re employed in? Keep it general – everyone likes a cheerful, reliable hard worker, don’t they! 10. Speak it out loud! Tell people what you’re doing. Not a million people, not everyone all at once, and of course there may be situations at work where you can’t talk about it. I know how powerful it was when I started saying “I’m going to go full time with my business by this time next year”, and I’m sure that it helped me to do that. Thank you for reading my top 10 tips for preparing for self-employment. Have you got any more? Do you madly agree or wildly disagree with any of them? Do post a comment and if you’ve found this interesting, please do use the share buttons to share this on whatever social media channel you fancy – it all helps to help people! If you’re considering setting up a new business or have recently done so, you will find plenty of careers resources on this website (click on that link or surf around the category cloud in the sidebar). Or why not take a look at my books, which have loads of information about starting and maintaining a freelance career. A commonly confused pair, this is in fact confusing when you start to look into it, too! Perhaps that’s why I’ve left it until now! Drier is the comparative of the adjective dry. So, today it didn’t rain very much, so it was drier than yesterday, when it poured with rain all day. This white wine is drier than that white wine. Liz’s laundry has been on the washing line in her North-facing garden all day and is no drier than when she put it out. You get the idea. A dryer is a device which dries things. So you have a tumble dryer or a hair dryer. Simple. But: drier is also an alternative or variant spelling of dryer. How disappointing. But we don’t need to use it as such, do we? Let’s keep those two alternatives going strong, and get our laundry drier by using our tumble dryer! Small business chat: You can do it! I’m afraid I have to break it to my loyal readers that I don’t have a new interview or an update this morning! I’m waiting for some responses to update requests; it can take time to think things through and work out your responses, of course. And I haven’t been taking many new interviews recently, so as not to crowd things – I am opening the series back up for up to five new interviewees now, so if you can commit to answering my questions now and updating me in a year’s time, do get in touch. Anyway, today I thought I’d look at the answers to one of my favourite questions in people’s first interview – because they are so inspiring. Here are the highlights in chronological order – I hope you enjoy reading them! To get out there and get myself seen and known rather than waiting for everything to be in place and for the conditions to be perfect – they rarely are. Go for it!! I would definitely tell myself to trust in my own abilities. Get off your backside, talk to people and find the work. The work won’t come and find you. You CAN do it. You know you can. It’s all down to activity. Get ready for some very enjoyable but incredibly long hours! Don’t be afraid of the competition – you are going to be better. Believe in yourself and your abilities. Be creative in getting people to know where to find you. And, always ask for referrals. Be fearless in your commitment to meeting the need you have identified and flexible enough to incorporate new ones. Trust your instincts and go with the flow – nine times out of ten you will do the right thing! Face everything with an enquiring mind and lots of energy. Go part-time – or more part-time, earlier! Enjoy the process and start a blog! Have more confidence in yourself – take the plunge and go full-time earlier! Be prepared to enjoy yourself – I never expected to feel so warmly towards the writers. “I should have done this years ago!” It’s the truth: I’m totally enjoying myself, doing something that I love with no one pulling you in different directions in terms of objectives, and essentially I don’t have to play the politics that are so often there in large organizations. Keep going, it will all be worth it. Most definitely to go for it! Be confident, trust and believe in yourself, you are unique, and don’t believe everything cold callers say on the phone! Relax. It will be fine. To have faith in myself and to just be myself. Oh and to buy the new BMW you were looking at; it would be nearly paid for by now! Remain unrestricted by what people tell you won’t work. There are always people who will shoot down any dream, or tell you that your idea won’t work. At the end of the day, none of us can see into the future, so nobody knows. The only way we can know if something will work is to go ahead and do it. Never let anyone tell you something won’t work: when they do, go and do it and find out for yourself. That it would be OK! The business would get there in the end. I would like to go back and tell myself not to lose faith; it’s never easy trying to make a living artistically, but when it does start to come together, it makes the hard times fade away, and it all becomes worthwhile. Most importantly – believe in yourself and know what you are worth. “You don’t have to go it alone,” and, “You know more than you think you do”. Not to hesitate: some risks are worth taking. That all the hard work is most definitely worth it. That I was on the right track and I just had to keep going. To always listen, never stop learning, keep the research up and be prepared to give it 100% ALL THE TIME. Decide what the main focus of your business is and don’t let yourself get side-tracked. I should have done it sooner. Where have you been hiding all these years? You can DO IT! have confidence and believe in your own abilities!!! Take all of the advice given and choose which is best for your business, and take the time to develop rather than ploughing headfirst, but also spare 5 minutes to be proud. You can do this! I definitely would’ve encouraged myself to take more risks, not to be scared to try and fail. I am definitely learning that people value you more if you value yourself. Both creatively and financially. Relax – it will be OK in the end! It’s amazing how easy it is to forget everything you know when you have everything else to think about when running a business. It would’ve given me the push to be able to take it full time much earlier, rather than waiting for redundancy to push me into it. Be less critical and do not under-value yourself, and what you make. Believe in yourself – especially when everyone is telling you that you’re good. Strangers don’t need to lie to you. Sell yourself more, you’re actually quite good! Don’t stress about problems, as they are inevitable in business. Focus on overcoming them and turning them to your advantage. To just get on with it. I need to keep telling myself that now too. Have confidence in what you make and keep pushing. Get more rest. Don’t worry so much. Fail faster. Be bolder. Keep at it and keep going. Few things start out easy. To believe in myself. Take the rough with the smooth. Give it time. Go for it! You can do it! Here’s more small business chat, the index to all the interviewees, and information on how you can have your business featured. If you’re considering setting up a new business or have recently done so, why not take a look at my book, Going It Alone At 40: How I Survived my First Year of Full-Time Self-Employment. In this series, we’ve already learned how to set up a WordPress blog, and how to add pages to make it into a WordPress website. 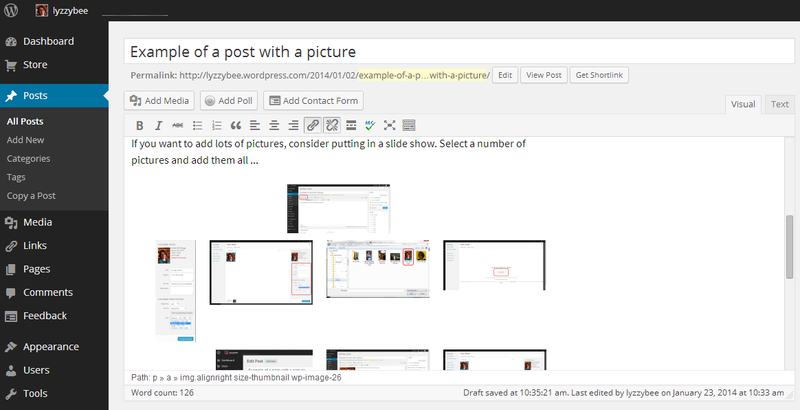 Last time, we talked about adding images to your blog posts and pages. 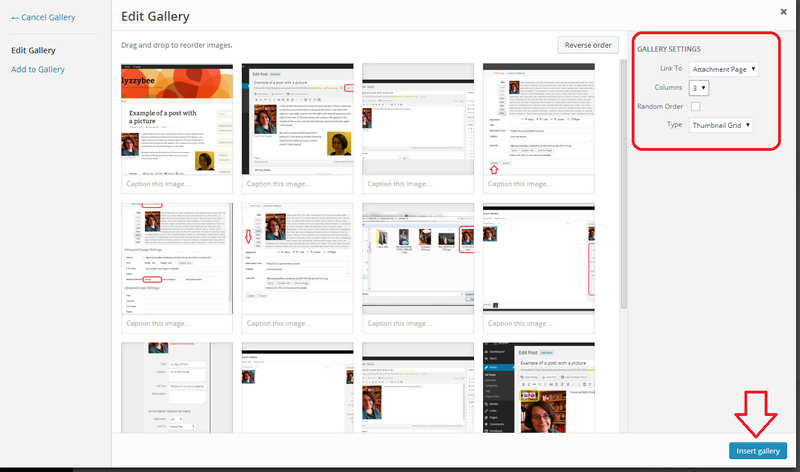 This time we’re learning how to create galleries and slideshows and add your image to your user profile in WordPress. 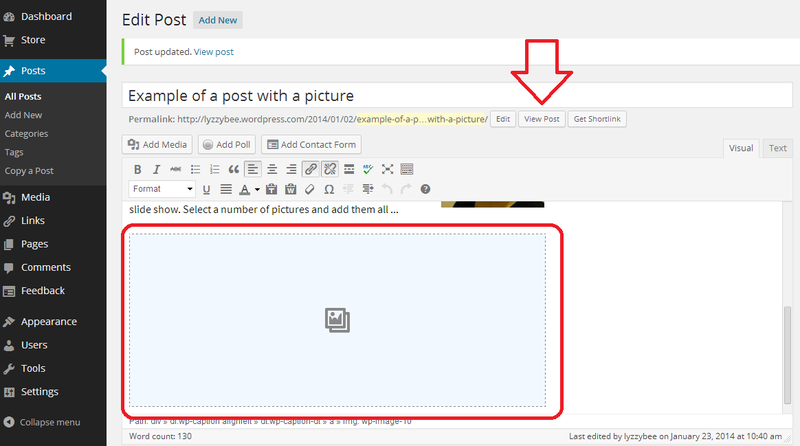 Why would I want to add a gallery or slideshow to my blog post or page? If you have a lot of images to accompany a blog post or web page, perhaps of artworks or craft items that you have created, and especially if you don’t have much text to accompany those images, so it’s going to be hard to format them on the page, consider adding a gallery (a grid of images) or a slideshow (one image shown at a time, with navigation buttons for the user). 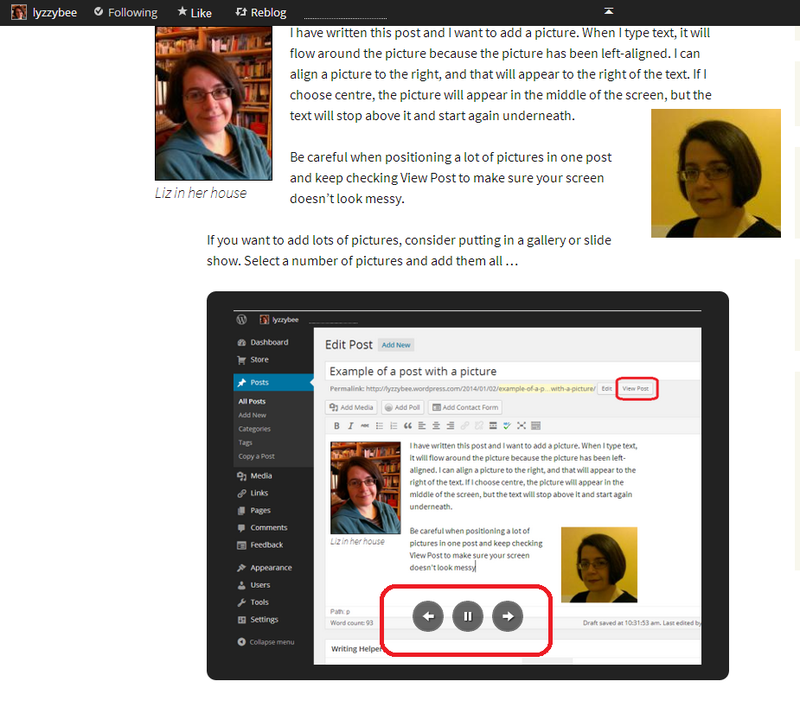 When you’re in the blog editor, you can use the Add Media button, with your cursor is in the position where you want your image to appear, to select and add the images of your choice. 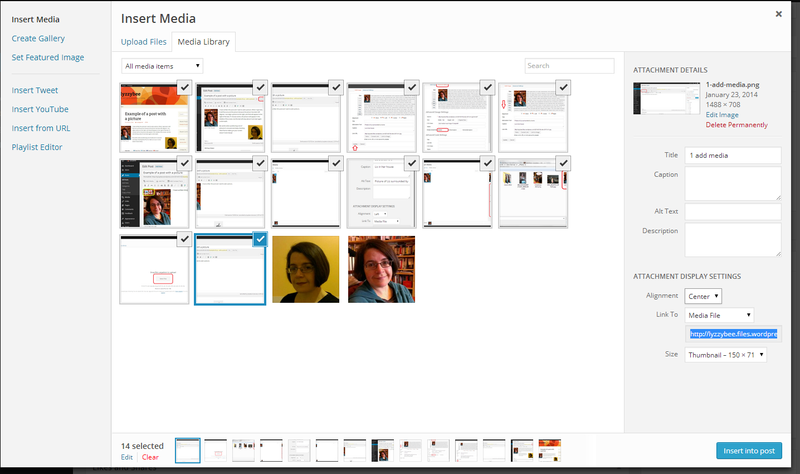 You can download multiple images at a time, and they will then appear on your Insert Media page. 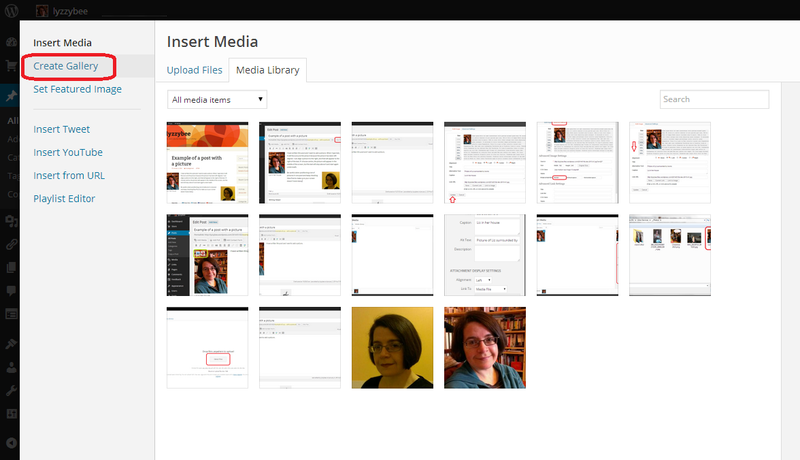 Viewing your Insert Media page, if you’ve already downloaded images and want to use or re-use them, these will appear in your Media Library tab. 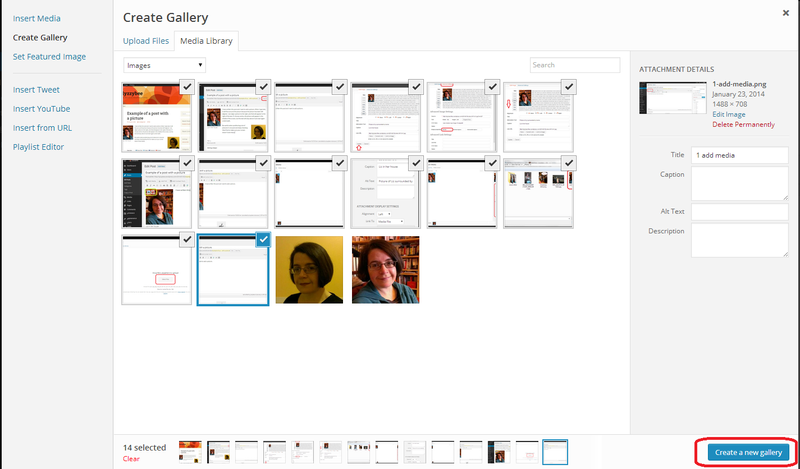 How do I insert multiple images into a blog post or web page? Here’s how to do it properly and neatly. How do I add a gallery of thumbnail images to a blog post or web page? How do I add a slideshow to a WordPress blog post or page? 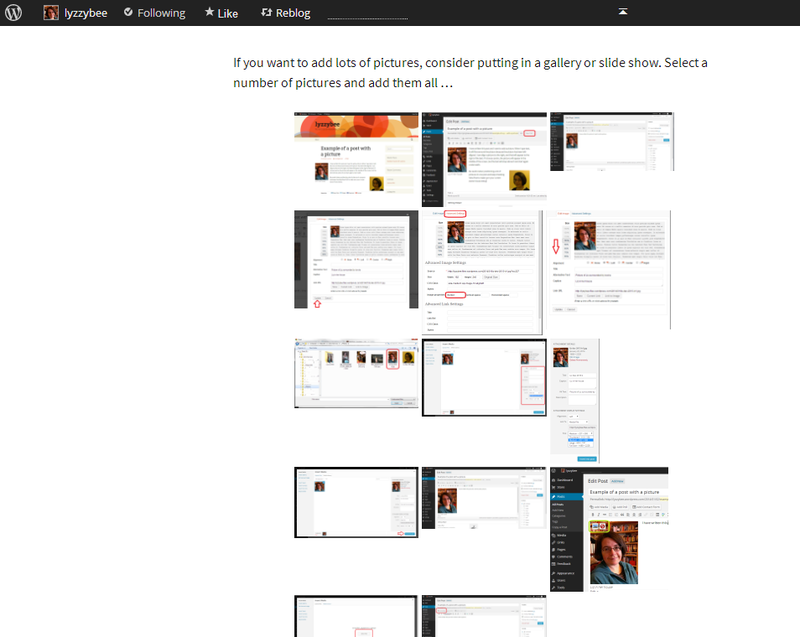 Today we have found out how to add multiple pictures to your blog post or web page using a gallery or slideshow. I hope that you’ve enjoyed this article and have found it useful. If so, please take a moment to share and comment – it helps to make other people aware of the help that they can find here. 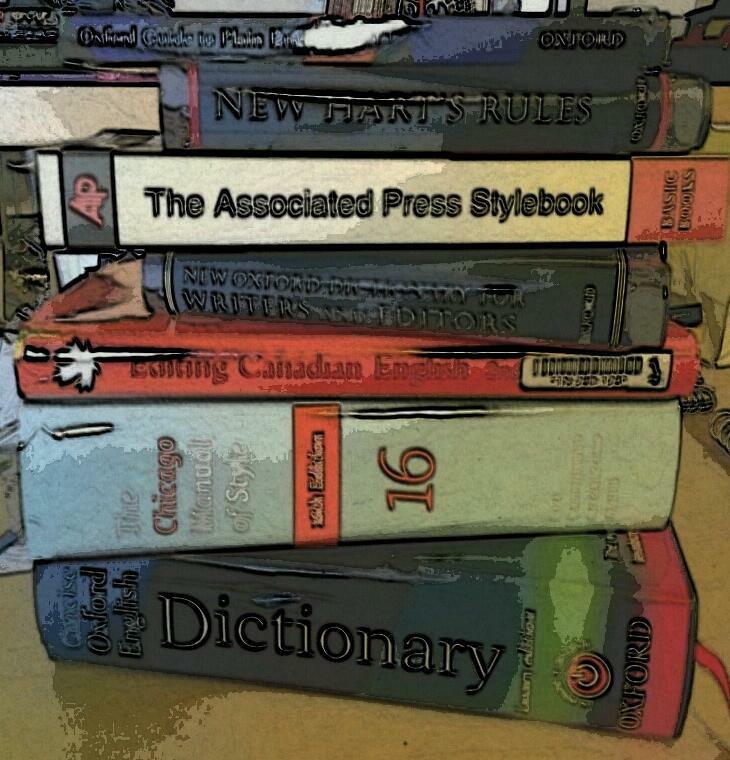 For more posts on blogging, social media, WordPress, Word, business and more, please have a look at the Resource Guide, or explore the categories to your right. Here we go with another Troublesome Pair. We have a slight spelling issue going on with the second of these two, as well, just to add extra value! Faint as an adjective means barely perceptible, slight, and in medical terms, close to losing consciousness: “Even the faint whiff of eggs was enough to make me feel faint”. The verb to faint indicates a sudden loss of consciousness: “She saw the horrible sight and fainted, falling to the floor, out cold”. Faint hearted – means lacking conviction or courage – another of our extensions into metaphor. A feint (not a fient) is a pretended or deceptive thrust or blow in the sports of boxing fencing (or in general fighting). “I feinted a punch to the left and ran around him as he ducked”. It is also, in my favoured usage, the term for paper which has been printed with faint lines to give a guide for handwriting – you will see “Narrow feint” or “Wide feint” printed on the front of notebooks or pads of paper. Time for another small business chat – I’ve brewed up a cup of Professor Elemental brand tea and settled down to find out what my old friend, Paul Alborough, aka Professor Elemental, is up to these days. I first interviewed Paul in February 2013 and his answer to my last question, where he wanted to be in a year’s time, was, “I’m thoroughly enjoying the freedom to take the professor character into some new and exciting places. There are a few things in the pipeline that might change my life completely. And if not, if things carry on just as they are, then I will be very happy indeed”. Well, the brand extension is going well, with tea, t-shirts, comics and a novel on the go as well as his splendid chap-hop videos and songs – and he’s embracing the strategic side, but not at the cost of the fun and eccentricity of the Professor and his doings. Read on to find out more! Much to my delight, I am pretty much where I’d hoped to be. I had a lovely year in 2013 and it’s allowed me to be a bit more strategic for this year, but without sacrificing the silly fun which is, after all, the most important part of the job. Well, much of my income still comes from live shows, that hasn’t changed. And while I dearly love the travel, the people and the opportunities that a live show brings, I am working new ways to push other creative projects which don’t involve me having to stay in a travel lodge in Basingstoke on a rainy thursday night. Steampunk is still a fine place to spend one’s time, I am still making silly music with people who I like and I am still dancing around like a loon about twice a week. In terms of what’s changed, the opportunities seem to be getting slightly more exciting and varied. There’s been things like voice over work for Disney and a publisher for a novel that I have written with a friend. These have taken the Prof in exactly the direction I wanted to push him. I have also come to terms with just how well organised you have to be, and how much creative projects benefit from careful planning and timing. 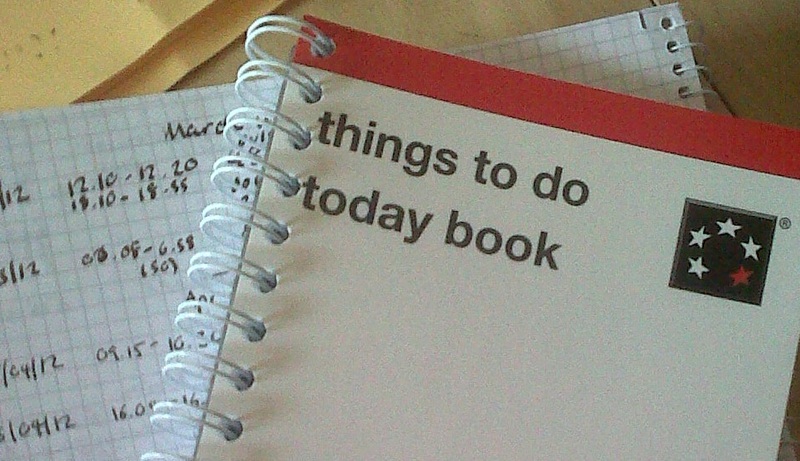 This has meant that I can plan my year ahead, rather than just being at the beck and call of promoters or my own whimsy. Always ask for a deposit when working for a private party, file your receipts properly, don’t mix your drinks at a show, never go out for a massive curry on your own directly before going on stage, getting the audience to do an egg and spoon race during a song is a terrible idea, the further north you go in England, the nicer people are, all Travelodge rooms inexplicably smell a bit of Lynx Africa, if someone doesn’t want to join you on stage, let them stay in the audience, if someone really wants to join you on stage, let them stay in the audience, Irish people dance to anything and if a large, bearded Mexican gentleman who calls himself ‘Wolf’ asks if he can buy you a drink, always politely refuse. Plan ahead, and take your time. So long as you enjoy the fun, creative part of the project, it’s worth using the rest of your energy to make sure that it is presented exactly as you’d like it and seen by as many people as you want it to be. Wow. I’m sorry, all of my other 100-odd participants in these interviews, but that answer to “What have you learned?” has to be the best answer ever. Read and learn, my friends! I’m so pleased to see Paul doing so well – I know how hard he works and how talented he is, and I can’t quite believe I used to catch a mundane commuter train to an office job with him not a million years ago (well, over 10 …). Do have a look at some of his work, you can access it all from the website below, or say hello on the Prof’s Facebook page. I look forward to reading about the next year’s developments! Find Professor Elemental online at www.professorelemental.com or visit his Facebook page and Twitter feed. f you’ve enjoyed this interview, please see more small business chat, the index to all the interviewees, and information on how you can have your business featured (I have a full roster of interviewees now so am only taking on a very few new ones). If you’re considering setting up a new business or have recently done so, why not take a look at my book, Going It Alone At 40: How I Survived my First Year of Full-Time Self-Employment. In this series of articles on Find and Replace in Word, we’ve looked at basic Find and Replace and advanced Find and Replace (wild cards and the like). Now we’re going to have a look at finding and replacing formats. Why would I want to search for formats? There are lots of reasons why you might want to search for formats. 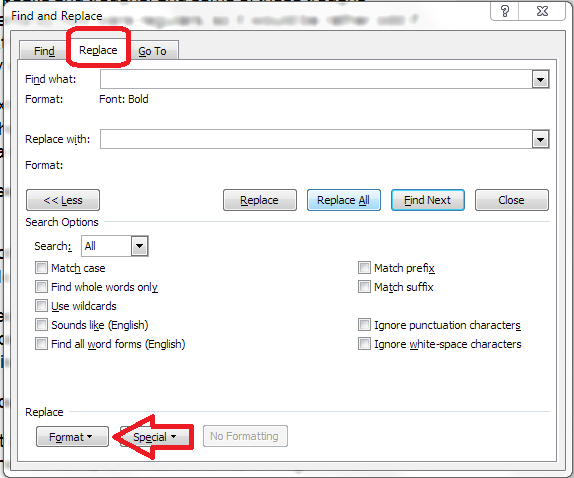 I’ve used this particularly when working with anything that has specific formatting for specific words or phrases. For example, you may have decided to italicise all book titles in your thesis bibliography, only to find that they’re supposed to be in no italics and bold. You can search for all text that’s in italics and change it to being in bold using Replace All (or Find Next – Replace, which, as we discussed in the first article, is a safer option just to be sure). 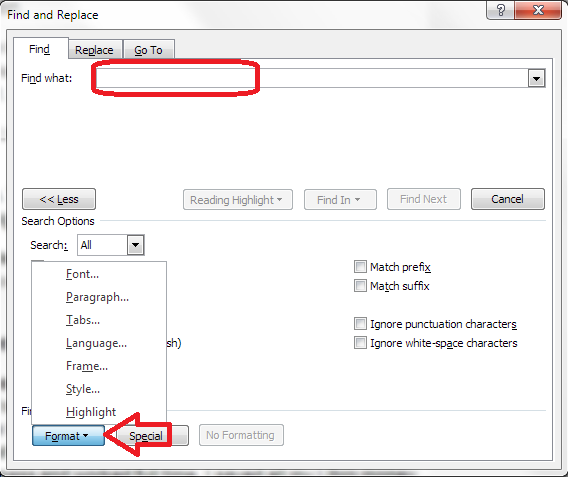 Another way I use this is if I need to look for manual page breaks that have been inserted into a document, or section breaks: it’s much quicker than scanning through hundreds of pages looking for formatting marks. 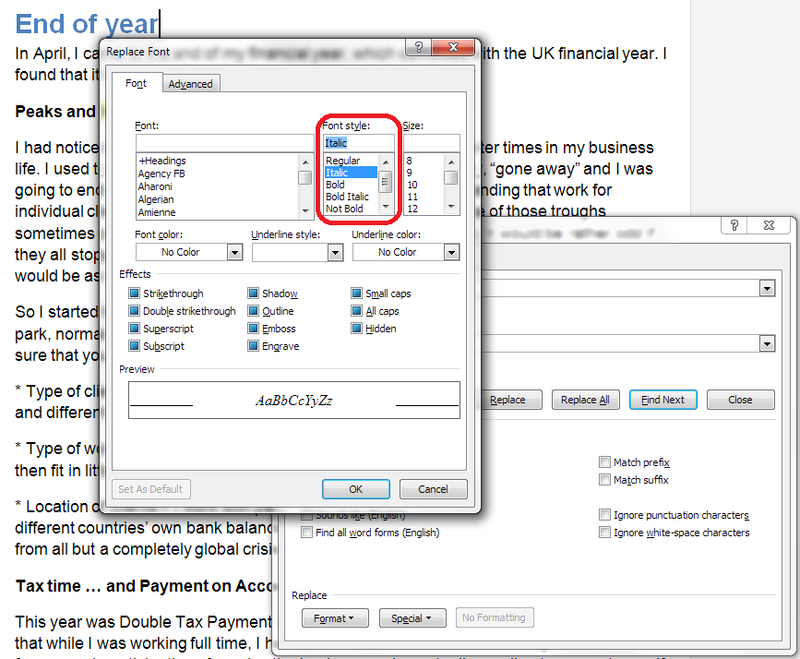 How do I search for formats in Word 2007, 2010 and 2013? 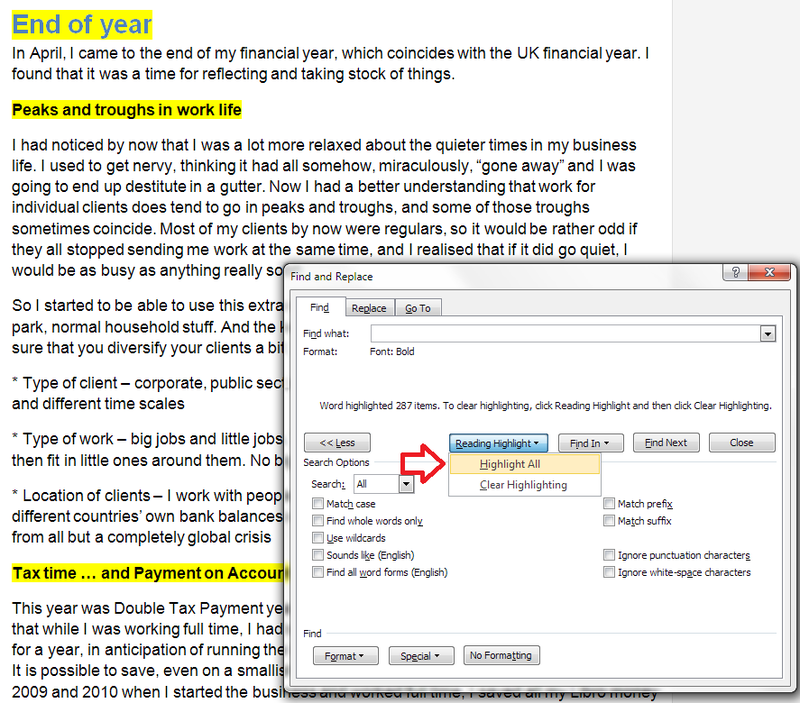 Some good news here first of all: once you’ve found your way to the Advanced search dialogue box, the procedure from here onwards is exactly the same for Word 2007, 2010 and 2013. Phew! How do I search for a word in a particular format? How do I remove format search from my search? 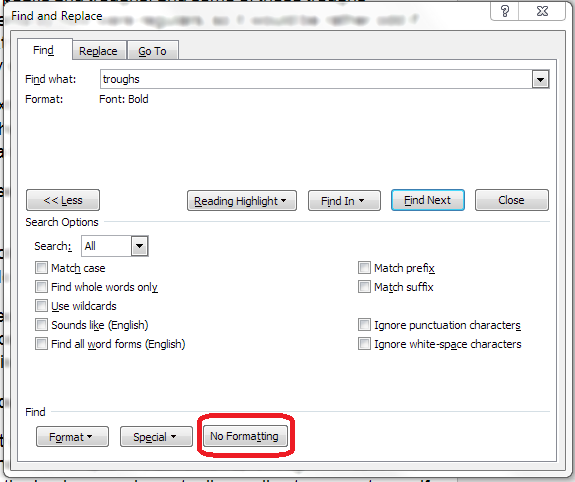 If you want to remove the format search, you will need to press the No Formatting button at the bottom of the screen. 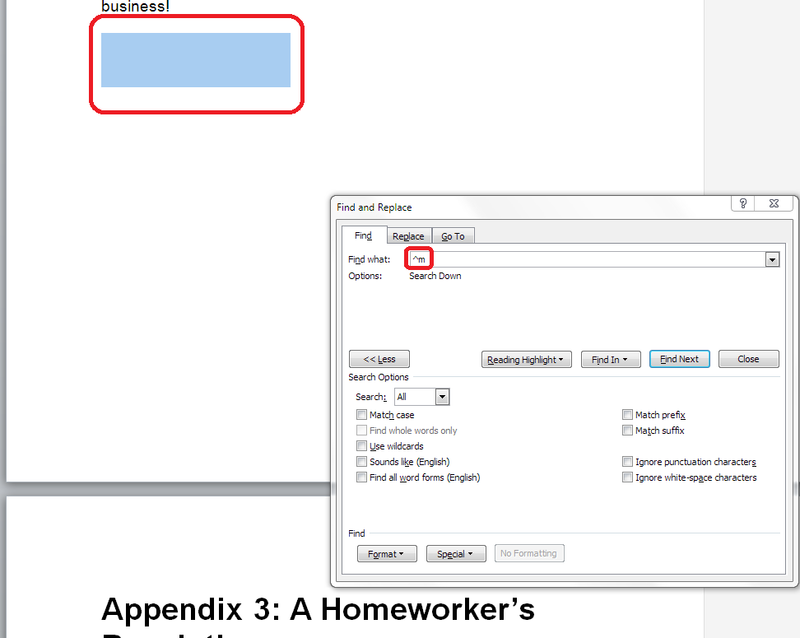 This will remove the “Format: Font: Bold” or whatever note from your Find What search box. 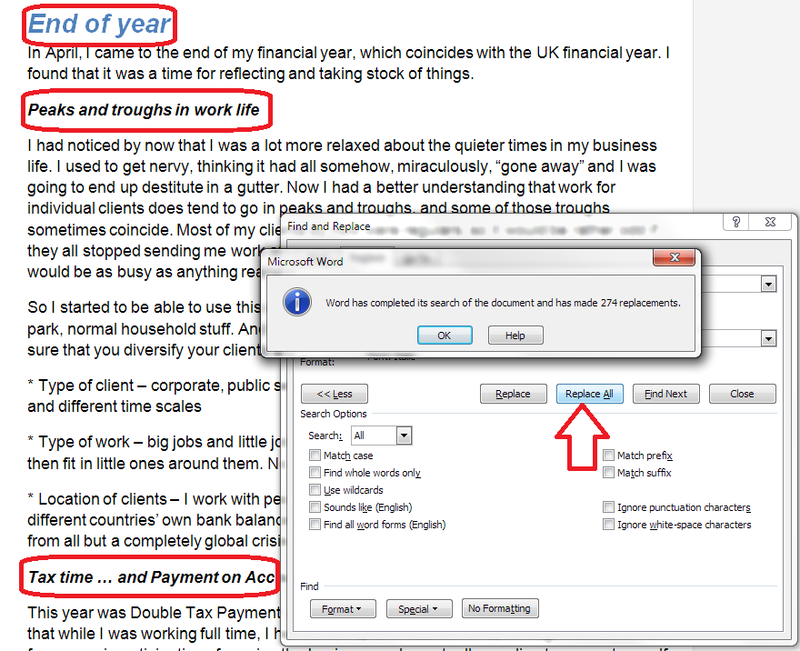 If you don’t remove it, Word will continue to only find text in that format, whatever you enter in the search box. How do I replace a format with a different format? How do I search for page breaks and formatting characters? 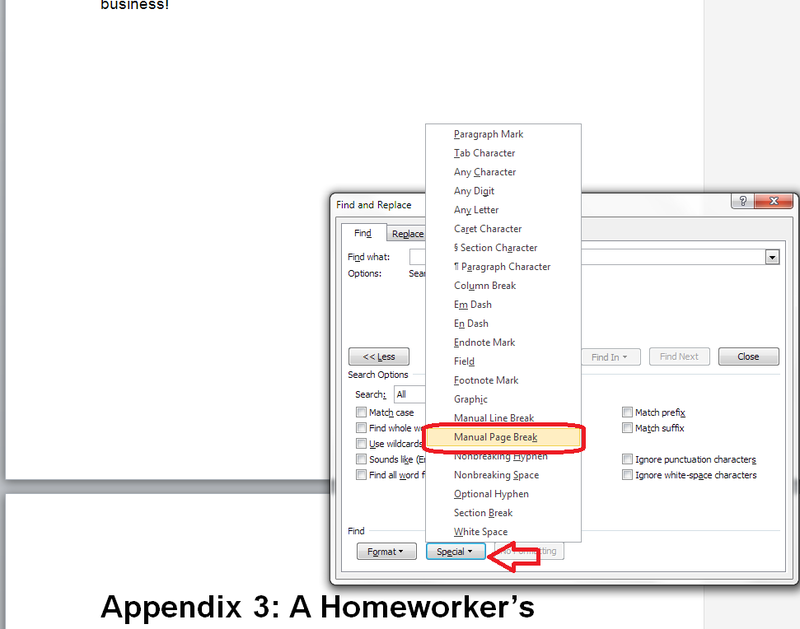 You can also search for different kinds of page formatting using the Special button at the bottom of the Find and Replace dialogue box. 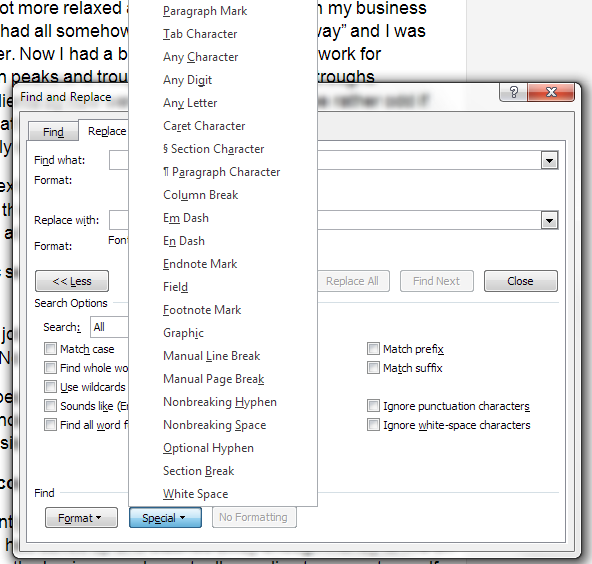 This gives you a whole range of formatting characters that you can search for, including paragraph marks, section breaks, etc. 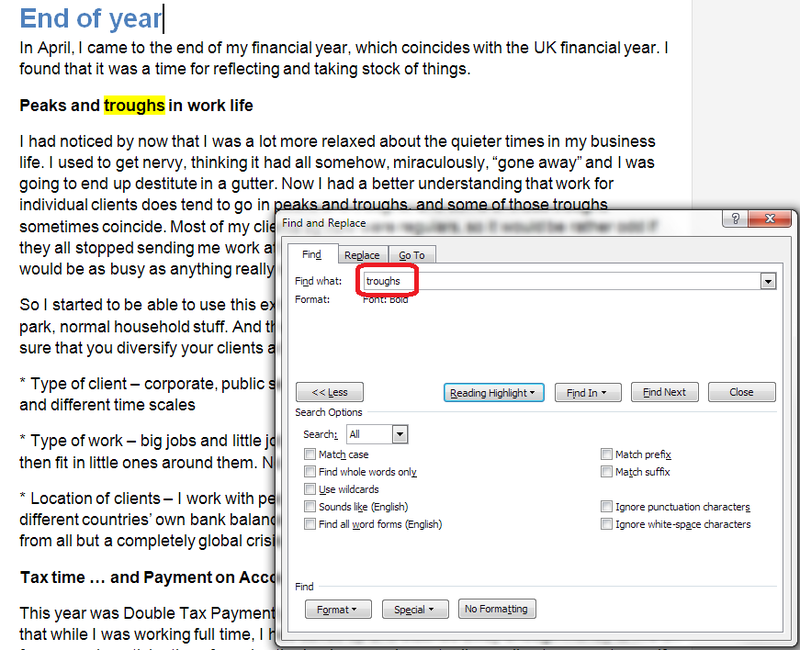 In this article, we’ve learned how to Find and Replace formats in Word 2007, 2010 and 2013, and how to search for breaks and other formatting characters. If you’ve enjoyed this post or found it useful, please do take a moment to share or comment – your comments and shares are always appreciated! Please note, these hints work with versions of Microsoft Word currently in use – Word 2007, Word 2010 and Word 2013 all for PC. 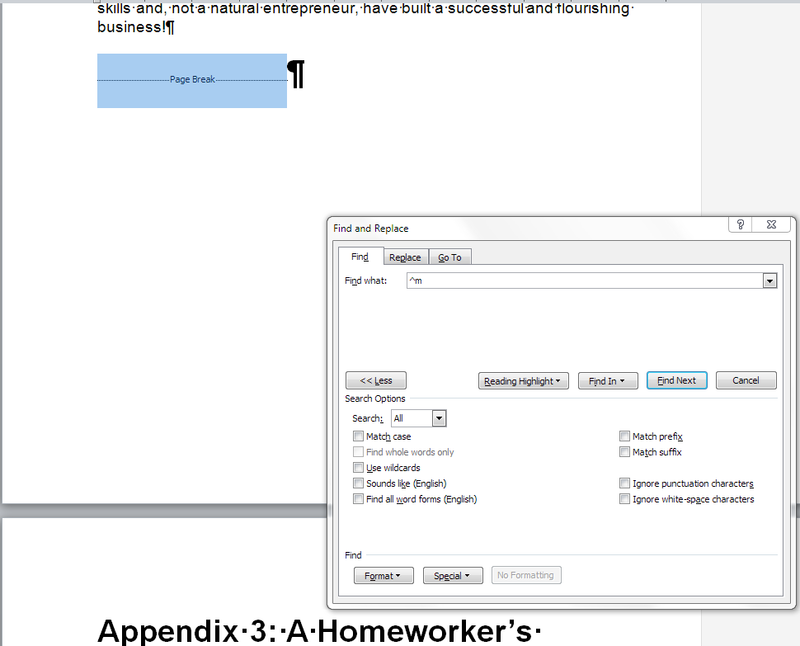 Mac compatible versions of Word should have similar options. 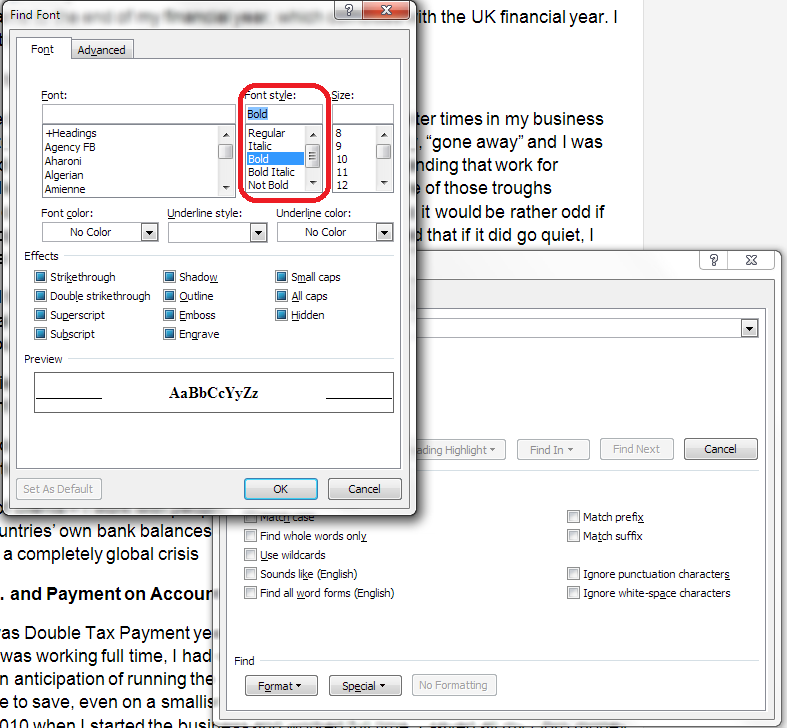 Always save a copy of your document before manipulating it. I bear no responsibility for any pickles you might get yourself into!